No sooner had I typed the words “there will be much, much more Simple Puff Pastry in my future” than I was already making it again. Store-bought puff pastry really might be a thing of the past in my kitchen. 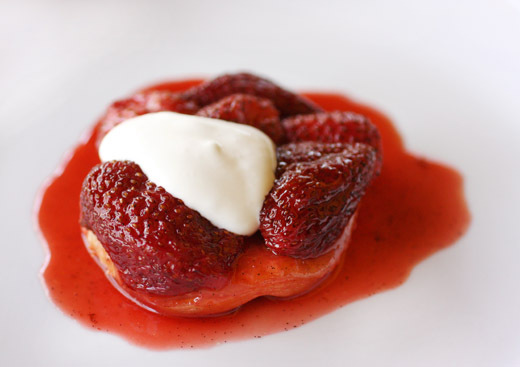 I had spotted this recipe for Mini Strawberry Tarte Tatins in an issue of Donna Hay Magazine last year, and the recipe is available online. I left it filed away until strawberry season rolled around, and by then I had discovered a way of making a quick puff pastry that works really well. I ignored the suggestion for frozen puff pastry and went with homemade. I also made the tarte tatins in ramekins rather than in a muffin tin as instructed since it seemed like it would be easier to plop them onto plates one at a time rather than turning them out all at once. And, I had so many lovely, red, ripe berries on hand, I overstuffed the ramekins just a bit. 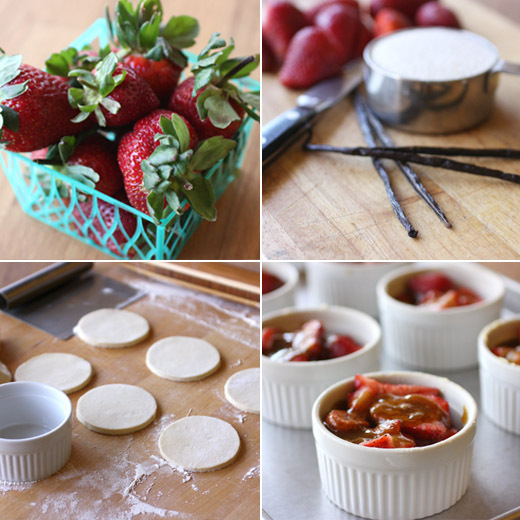 The hulled strawberries go into the ramekins first, and then a quickly-made vanilla caramel is poured over them before rounds of pastry are added. The vanilla caramel and juices from the strawberries meld into a fabulous syrup in the oven. Not that these need any gilding, but I topped each serving with a spoonful of creme fraiche anyway. Making the Simple Puff Pastry was so delightfully easy the first time, I was happy to do it again. I made the pastry a day in advance and rolled it out and cut circles for the ramekins. I increased the quantities for the caramel sauce and made enough for six desserts baked in six-ounce ramekins. The original recipe makes four desserts in a muffin tin. Still, I had some leftover puff pastry for a few turnovers. The ramekins were buttered, and hulled strawberries were added to each. The caramel was made in a skillet with butter, sugar, water and a scraped vanilla bean and its seeds. It cooked for a few minutes before being spooned over the strawberries in the ramekins. Puff pastry circles were set on top, and the dishes went into the oven for about 25 minutes. The strawberries slump into the caramel as they bake, and the pastry attaches itself to the fruit and syrup. A little heat from the oven, and these simple parts turn into an amazingly tasty dessert. This may or may not make a good dinner party dessert since you’ll want to lick every drop of the syrup off the plate, but it just depends on the kind of dinner party you're hosting, I suppose. Looks delicious!! Love the addition of caramel!! Divine! This version is great. I really must look more into making the easier version of puff pastry if only to have on hand when strawberries hit the farmers market. Oh my goodness! I would pay for this to appear at my desk right now! These tarte tatins look sensational! Homemade versions are always better! Making puff pastry must be fun too! These tarte tatins look heavenly! Just in time to make something with strawberries! That strawberry syrup just looks so irresistible, Lisa! Your tarte tatins so look much better than those from the original recipe. How did you manage to have the puff pastry keep a little of its natural color and avoid having it turn the same dark red as the strawberries? Hot strawberries are so delicious and I can imagine the juice soaking in the pastry. Yummy. I find making buttery pastry addicting! The Strawberry Tarte Tatins are charming! A compelling post Lisa! Lisa this is the perfect spring time dessert with fresh strawberries and caramel, delicious! Beautiful! I think you've made me a believer on simple puff pastry. I like frozen puff pastry only because it's always on hand! Although the fancy brand is awfully good. But otherwise, homemade is definitely better. Lovely dessert - really excellent stuff. Thanks so much. 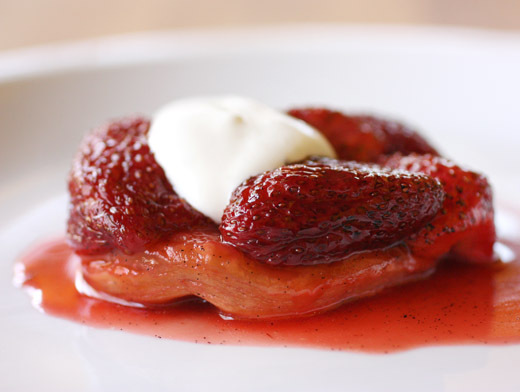 That's the first time I've seen strawberries used in a tarte tatin and they look divine. Drool inducing! very nice use for it, I know Phil would go crazy for this dessert! OH-so-classy yet painless and delicious--that's the ideal dessert as far as i'm concerned! Wow! They look soooo good, Lisa! What a great idea! They look delightful. When I could eat wheat, I used to use a lot of puff pastry. It is so versatile for sweet and savoury dishes.